We provide the best quality Reclaim Rubber in markets. 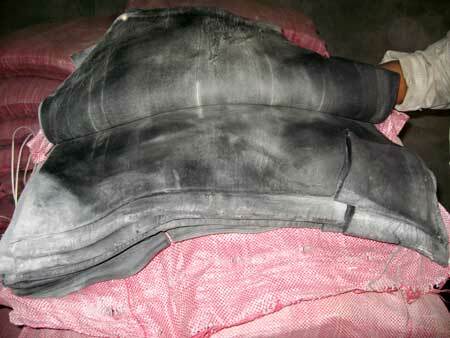 The Black Reclaimed Rubber offered by us is reprocessed from the good quality natural rubber. Our Latex Reclaimed Rubber is used for the production of rubber products like Conveyor Belt, V-Belts, Tyer-Tubes and so on. Our reclaimed rubber is high on strength with superior elasticity. It is properly tested on different parameters before supplied in the market. Apart from that, we are recognized as one of the prime Butyl Reclaim Rubber Suppliers in India. Application : Tyres, Tubes, Automobile Parts, Hose Pipes, Mats, Conveyor Belts, V-belts, Footwear, V-belts, Mats, Tiles, Adhesives, Sound Dampers, Rubber Sheets, Battery Containers & all other Rubber Oulded Goods. Benefits : Faster Mixing, Cost Reduction, Improved Extrusion,. HR-Grade â�� Highly Refined grade. MED-Grade â�� Medium or passing grade.